Background: Regardless of contemporary improvements in cancer treatment, the results of drug treatment are not always efficacious. Thus, the development of novel approaches that affect cancer cell-specific metabolic pathways is needed. Since much evidence has shown that tumor cell proliferation and motility are stimulated by glutamate via activation of its receptors, use of antagonists to these receptors may be the key to control cancer cell progression. Riluzole noncompetitive metabotropic glutamate receptor 1 (mGluR1) antagonist, commonly used to treat patients with amyotrophic lateral sclerosis (ALS), has shown some antineoplastic properties against melanoma, breast and prostate cancer. Yet little is known about its molecular mode of action. 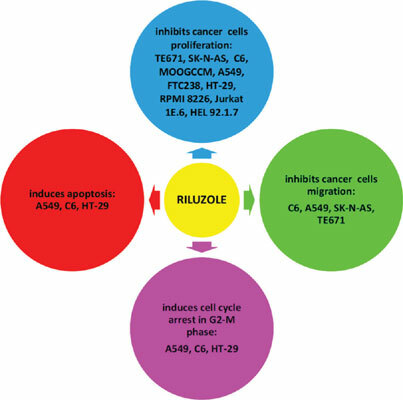 Aims: The current study aims at evaluating the abilities of Riluzole to inhibit proliferation of several cancer cell lines, as well as resolve the mechanism of its action. Method: We demonstrated antiproliferative and antimigrative properties of Riluzole in rhabdomyosarcomamedulloblastoma, neuroblastoma, astrocytoma, glioma, colon cancer, lung cancer, thyroid carcinoma, leukemia, erythroleukemia and multiple myeloma. Our studies revealed apoptosis induction and G2-M cell cycle arrest in Riluzole treated A549, C6 and HT-29 cells. Result: At the molecular level, we found that these cells treated with Riluzole had a decrease of Cyclin B and an increase of p21 Waf1/Cip1 and p53 expression. We also observed an enhancement of CDK1 and Chk2 phosphorylation. Reported changes may suggest the involvement of these proteins in G2-M arrest, observed in flow cytometry analysis. These data indicated the potential use of Riluzole in the treatment of different types of cancers. Riluzole, proliferation, apoptosis, G2-M cell cycle arrest, migration, tumor.